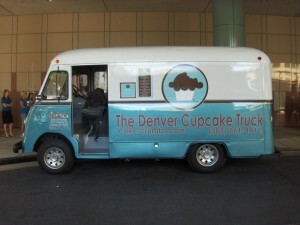 Denver Cupcake Truck – Denver, CO (@cakecrumbstruck) – Food Truck Talk – Searching for the best foodtrucks! One thing that makes people, organizations and food trucks successful is passion. Passion is the one quality that can push something from being mediocre to being great! The Denver Cupcake Truck is passionate about their food truck products, but perhaps even more importantly is how passionate their customers are. One customer wrote the lyrics, composed, and choreographed this wonderful little ditty in tribute to the Denver Cupcake Truck, just so she could win a free cupcake! Personally I believe they should have signed her to a long term personal appearance and promotional contract. Appropriately enough, her creation is called “The Cupcake Dance”. Post by The Denver Cupcake Truck. Sean Moore, aka “the cupcake guy” is found operating the Denver Cupcake Truck, but he is also the owner of the Cake Crumbs a great bakery and cake shop in the Denver area. The Denver Cupcake Truck features a variety of cupcakes each day, including a “mystery” capcake. Ask Sean about that next time you stop by the truck. The variety of flavors is great including the Denver Snowball with almond cake topped with chocolate frosting and coconut. I salivate over the thought of the S’mores Cupcake; chocolate cake accompanied with honey grahams and gooey marshmallow topped with chocolate frosting, a chocolate piece, toasted marshmallow and graham cracker. For a seasonal treat try the Carrot Cupcake; Sweet carrot cake topped with cream cheese frosting and tangy dried cranberry. For those chocoholics out there you won’t be able to resist the Chocolate Overload Cupcake; chocolate-chocolate chip cake with chocolate frosting and dipped in mini chocolate morsels. Each cupcake is a winner. 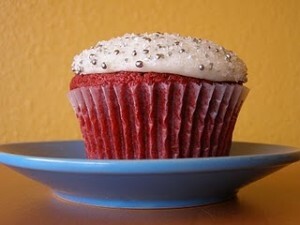 Each cupcake is also available in a variety of sizes depending on your level of hunger and calorie intake limits. Mini cupcakes start at just $1, the standard and jumbo are sure to satisfy those with larger appetities… or they are fun to share.